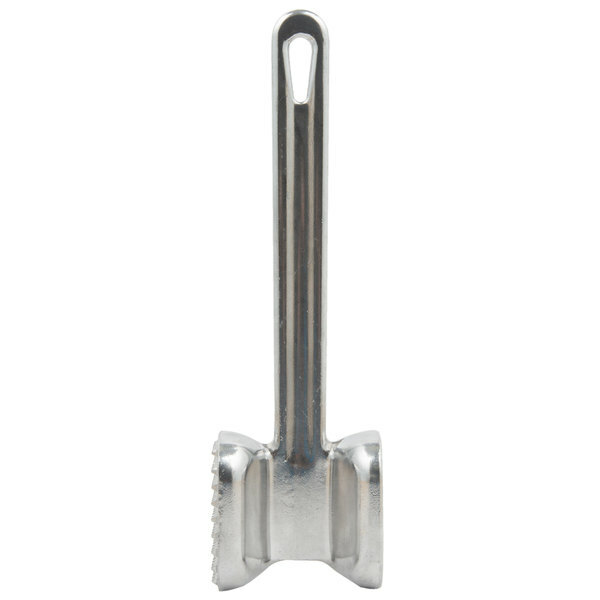 Quickly prepare your meats for your restaurant or catered event with this 2 3/8" x 2 5/8" meat tenderizer! 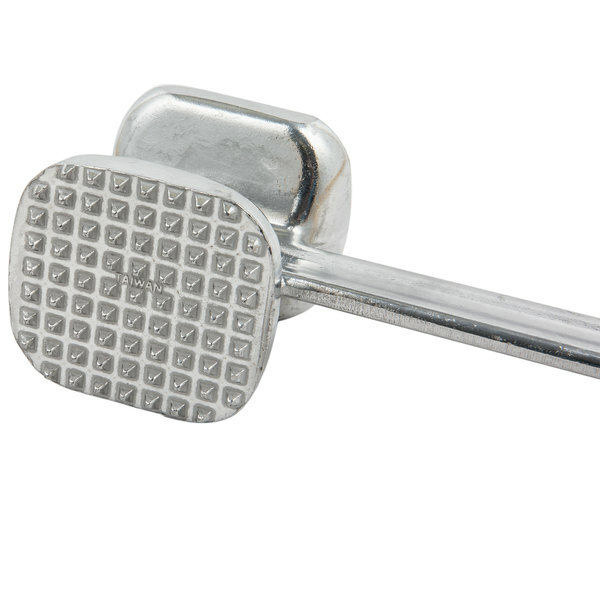 With a wide handle, this heavy-weight tenderizer is easy to use and will fit snugly into a user's hand. Plus, the cast aluminum head has one course-cut face and one fine-cut face to allow for different degrees of tenderizing. 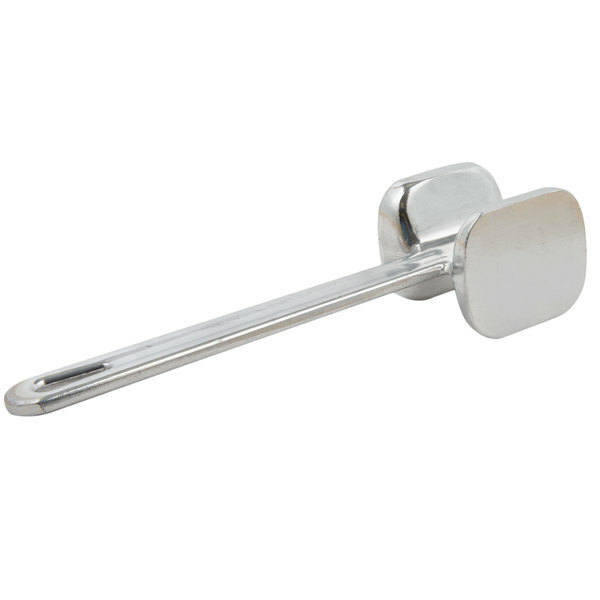 This meat tenderizer is quite heavy which is perfect for tenderizing meat. With just a few strikes, a piece of chicken breast becomes a nice chicken fillet. This tenderizer takes and gives a beating! We use this for pounding out chicken breast and pork tenderloin to batter and put on sandwiches and sliders. Good quality meat tenderizer. We use ours often and it works as described. It hold up will against any meat and does not easily demand. 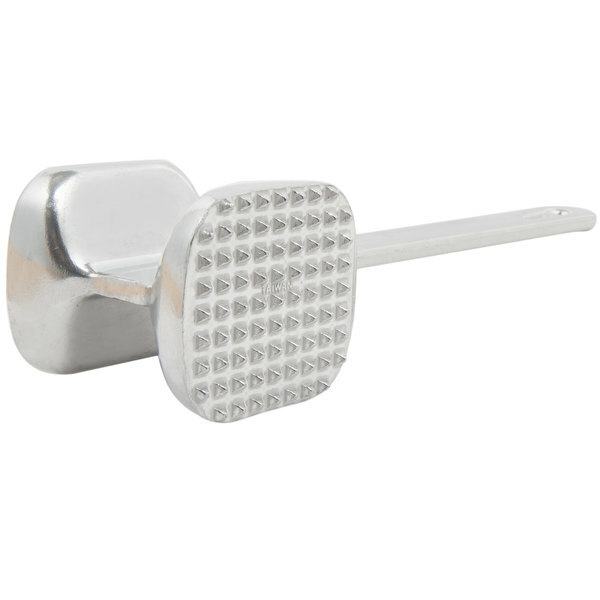 Great quality meat tenderizer with good feel on hand. I like how it doesn't feel cheap and sufficiently heavy to pound the meat. It's also really easy to clean and handwash. I can't ask much more than that. I love the design and makeup of this meat tenderizer because its all metal and makes it super easy to clean in very hot water. 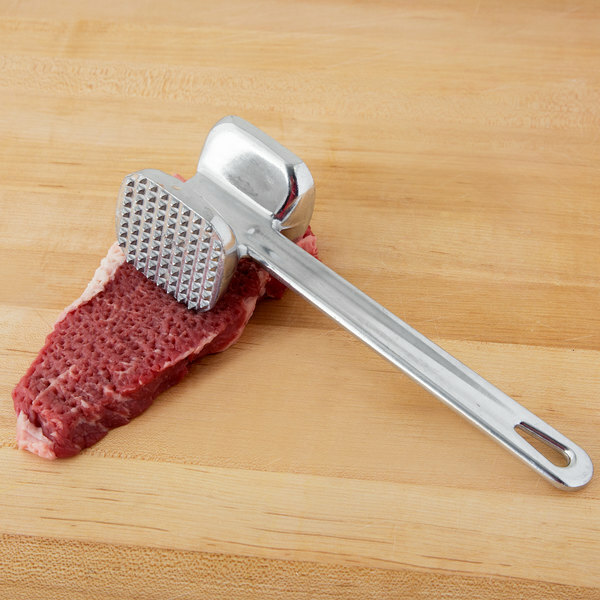 The tenderizer is small and compact and makes it easy to handle. A great product for our business. Good weight to it without being unwieldy. I have not used the tenderizer side, but have effectively thinned chicken breasts with the smooth side. Dock 1 star as it is not dishwasher safe. I cannot recommend this product. The picture of the meat hammer is somewhat misleading. The side of the meat hammer used to tenderize the meat are to shallow. They look deep in the picture, but they are just shallow nubs. They are so nubby, and lack depth they don't penetrate the meat to break up the fibers of the meat. There is hardly any difference between the smooth side and the other side that you use to tenderize with. Awesome quality at a great price ... I used my pro quality meat tenderizer to thin out my cutlets and what a difference from using my old small tenderizer ... Better job at half the time .. The large pounding surface area does a better job at half the time ... Excellent for tenderizing steaks for a melt in your mouth culinary experience . This mallet works exactly as it's intended. It feels very sturdy and nice weight to it that makes it a pleasure to use for pounding out chicken. I am pleasantly surprised by the quality of This meat tenderizer . I did not expect it to be heavy which helps when you are tenderizing meat . I like this mallet to pound out the chicken breast for stuffing. I bought it because we have one at work and i really like to use it. 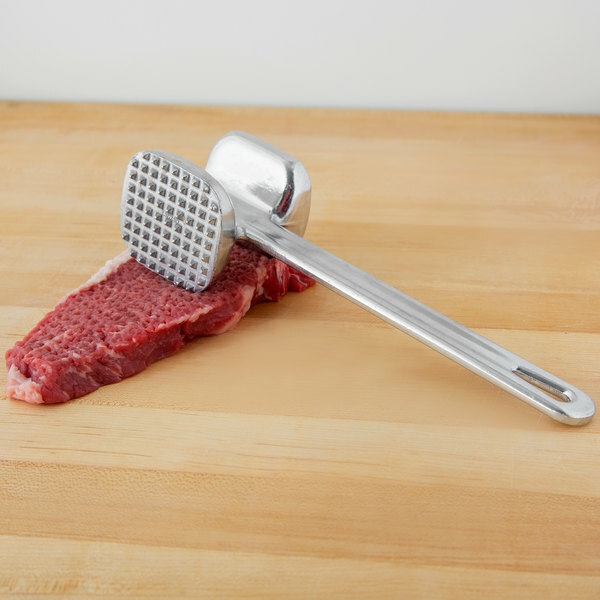 This meat tenderizer is made exceptional well. It js heavy weight, sturdy and doesnt break easily. It is highly effective at tenderizing meats. I would highly recommend it! This meat tenderizer is strong and well made. I have broken cheaper made metal tenderizers. The only downside is that after maybe 50 trips through my dishwasher the coating is coming off the meat tenderizer. The metal seems to get a white powder covered over it when I remove it from the dishwasher. I am told this is due to my dishwasher soap as opposed to the tenderizer however, I don't remember this happening before. We appreciate your review, Robert! 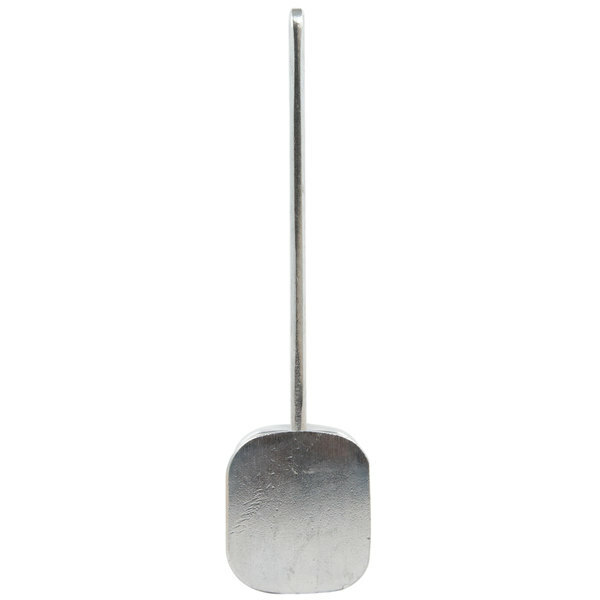 We recommend hand washing this meat tenderizer to preserve the coating.